Meanwhile, emboldened Republican rival Donald Trump has seized on the reignited email controversy, hoping to raise new doubts about Clinton’s trustworthiness. 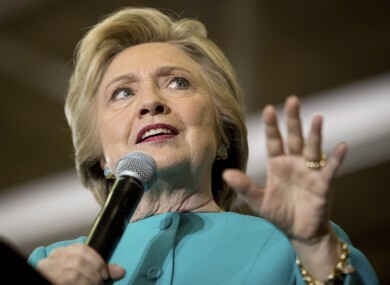 Rallying supporters in Florida yesterday, Clinton pressed FBI Director James Comey to put out the “full and complete facts” about the review into a cache of recently discovered emails. Clinton backers panned Comey’s letter to Congress about the new emails as severely lacking crucial details. “It is pretty strange to put something like that out with such little information right before an election,” Clinton said. She accused Trump of using the issue to confuse and mislead voters in the final leg of the campaign for the 8 November election. The controversy over Clinton’s email practices at the State Department has dogged her for more than a year. The former secretary of state has often been reluctant to weigh in on the matter — and defensive when she’s been pushed to do so. But Clinton’s approach to this latest flare-up is markedly different, underscoring worries that the matter could damage her standing with voters in the election’s final days. Clinton advisers have been rallying Democratic lawmakers and other supporters to her defence, including members of the Congressional Black Caucus. But Comey, who enraged Republicans in the summer when he announced the FBI would not prosecute Clinton for her loose handling of official email, said the new trove appeared to be “pertinent” to the Clinton email investigation. He did not explain how. A government official told The Associated Press that the Justice Department had advised the FBI against telling Congress about the new developments in the Clinton investigation because of the potential fallout so close to the election. The official was not authorised to speak publicly about the matter and discussed it on condition of anonymity. Landing with a thud, the email issue again threatened to undermine an advantage built by Clinton, the Democratic nominee, over Trump and raised the possibility that the Republican might be able to seize late momentum. Trump told a crowd in Golden, Colorado, the FBI’s review of Clinton email practices raises “everybody’s deepest hope that justice, as last, can be properly delivered.” His crowd cheered Clinton’s email woes, which Trump has taken to calling the biggest political scandal since Watergate. The FBI is looking into whether there was classified information on a device belonging to Anthony Weiner, the disgraced ex-congressman who is separated from longtime Clinton aide Huma Abedin. Comey, in his letter to Congress on Friday, said the FBI had recently come upon new emails while pursuing an unrelated case and was reviewing whether they were classified. A person familiar with the investigation, who lacked authority to discuss the matter publicly and insisted on anonymity, said the device that appears to be at the centre of the new review was not a computer Weiner shared with Abedin. As a result, it was not a device searched for work-related emails at the time of the initial investigation. The person said “this is news to (Abedin)” that her emails would be on a computer belonging to her husband. Trump mused aloud during his rally about whether Clinton was “going to keep Huma,” adding that Abedin has “been a problem.” He hurled insults at Weiner, warning again that the former congressman posed a national security risk because of his access to information through his estranged wife. Abedin, a close Clinton confidant who is a near constant presence in the campaign, was not travelling with Clinton yesterday. Long term, the development all but ensured that, even should Clinton win the White House, she would celebrate a victory under a cloud of investigation. Comey, who was appointed in 2013 to a 10-year term as FBI director, would still be on the job if Clinton wins the White House. Congressional Republicans have already promised years of investigations into Clinton’s private email system. And that’s only one of the email-related episodes facing her in the campaign’s closing days. The tens of thousands of confidential emails from Clinton campaign insiders that were hacked — her campaign blames Russia — and then released by WikiLeaks have provided a steady stream of questions about her policy positions, personnel choices and ties with her husband’s extensive charitable network and post-presidential pursuits. Given a political gift from the FBI, Trump’s challenge now becomes avoiding any big missteps that might overshadow Clinton’s troubles over the campaign’s final days. If history is a guide, that won’t be easy. Email “Clinton says FBI actions 'deeply troubling' as Trump steps up his attacks”. Feedback on “Clinton says FBI actions 'deeply troubling' as Trump steps up his attacks”.